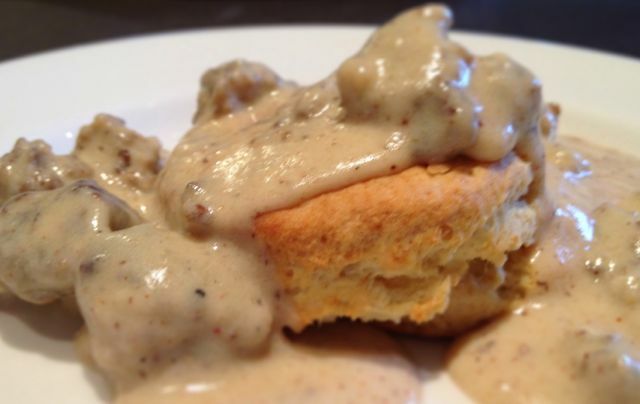 Download PDF Sausage Gravy & Biscuits is another Southern classic that you must have in your breakfast arsenal. My Mom makes it slightly differently using a slurry of milk and flour just like her mother did. I’ve branched out a bit, and prefer to use a proper roux. The flour taste gets cooked out bringing the sausage flavor front and center. Mom and Grandma Cooper only used salt & pepper to season their gravy, which was terrific (and very traditional for us), but again I’m a renegade, and I like the slight sweetness that nutmeg brings to creamy dishes, as well as a tiny bit of spice in the form of ground chipotle pepper, both of which work great with the peppery sausage! As a tribute to Grandma Cooper, I’m including a link to the Martha White Flour Cream Biscuit recipe to go along with your gravy, although Orville is perfecting his own amazing biscuit recipe, soon to make its way here. Grandma was from the South, but moved to Ohio when she married. Famed in her Southern family for her biscuits, a staple of every farm table at breakfast, lunch AND dinner, she found something was wrong when she baked her staple in the North. She realized that the flours she could buy in Ohio just weren’t the same as her usual Martha White Self-Rising. Martha White had that special something (a lower protein level, I now know) that made for fluffier biscuits than she could get with the flours she could buy in the North. Since Martha White wasn’t yet available in the North, every year when she travelled down South to visit her family she would bring back a huge supply of her beloved Martha White Self-Rising Flour for a year’s worth of fluffy goodness. Since the gravy and biscuits can be made before your guests arrive and reheated quickly, it’s great for a brunch gathering. This recipe scales just fine, so go ahead and double or triple it for a crowd. Just let it thicken for a minute before you add that last bit of milk. That way you can adjust the last milk addition as necessary to make a thick-but-not-too-thick gravy. You can always add a bit more milk to thin it out, but once it’s too thin, you’ll need more roux to bring it back. Thaw the sausage. Crumble in a skillet and brown over medium heat. Remove sausage to a plate and drain away all but 1 tbsp of the rendered fat (generally, there isn’t much fat at all, so I leave it all.) Reduce heat to medium-low. Add butter to pan. When it melts, add the flour, stirring to combine into a paste. LOOK—you made a roux! Cook for 1 minute until it flattens and begins to foam. Add the bullion cube, crushing and stirring it into the paste. Slowly pour in 1/2 cup of the milk, stirring or whisking to prevent lumps. Incorporate the remaining milk 1/2 cup at a time. Cook until thickened, 1-2 minutes. Add the nutmeg, black pepper, chipotle pepper and sausage. Stir to combine. Taste it—season with a pinch of salt if need be. Serve over hot biscuits.